Rachmaninov’s Third Piano Concerto, fondly referred to as 'Rach 3' or even 'Rachi 3' in dealer circles, has enjoyed a constantly growing popularity over the last few years. One reason may well be that the market has been flooded with recordings of the work, many of which attempt to outshine their rivals with massive sound effects instead of winning over the listener with musical transparency. Well, as everyone knows only too well, a first-class recording not only demands a world-class soloist but also a top notch orchestra and conductor. That’s no surprise to anyone! 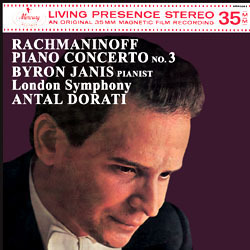 This early stereo LP with the pianist Byron Janis and conductor Antal Dorati was and still is an enormous success, as is proved by the fact that it is regarded as a work of reference even in this age of the silver disc. Janis performs with a controlled passion, like a fine mechanic who watches with the greatest of care over the structural elements which have been entrusted to him. His playing is precise and lucid down to the smallest detail, even in the minutest trill. Dorati has his ensemble enter gently with punctilious timing and allows the fullness and energy of this late-romantic score to unfold before us. How wonderful that this particular 'Rach 3' is available once again to eager audiophile listeners!